Gonzales and Crepp went to the California Institute of Technology in October 2014 to conduct observations remotely using the W.M. Keck Observatory in Hawaii. To prepare, she reviewed his database of past observations in search of a target and found that they were in the appropriate time frame to observe a suspected companion of the nearby star HD 4747. 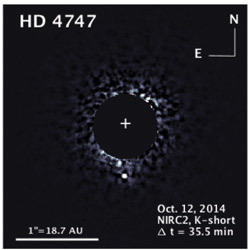 On the second half-night of observation, they collected information that, upon Crepp’s analysis, revealed the brown dwarf HD 4747 B. No other telescope had seen the object previously.